Not only the basement area even the ground floor above is showing some important features of the first version of the building. Especially the whole timber work comes from the original time. 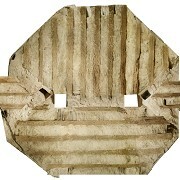 In order to increase the optical contrast and at the same time the visibility, the wooden beams had been dampened by a water sprayer for the photogrammetric documentation.